He disclosed this on Weibo in response to a post made by Xiaomi C.E.O Lei Jun, asking Black Shark fans to share their expectations and suggestions to the Black Shark team. 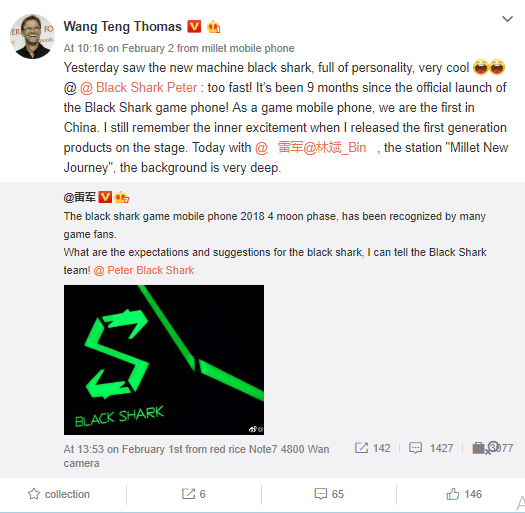 Wang, in response to the post, disclosed that he saw the new Black Shark 2 gaming phone and it looks ‘very cool’. The first edition of Black Shark gaming phone was introduced in April 2017 and it is armed with a Snapdragon 855, 8GB of RAM and running on Android 9 Pie. A follow-up model was later launched in October same year with the name “ Black Shark Helo” which hosts 10GB of RAM. More information on the specifications of the upcoming Black Shark 2 gaming phone was not shared by Wang, it is assumed that it is coming hot with Snapdragon 855.